The Business Owners' Guide contains all the information and resources entrepreneurs need to grow their businesses. The magazine contains more than 150 organizations and agencies to help your business grow. 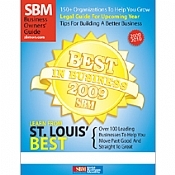 In addition, the magazine contains SBM's Best In Business (a guide to the best companies in St. Louis) and a complete legal guide for the upcoming year.